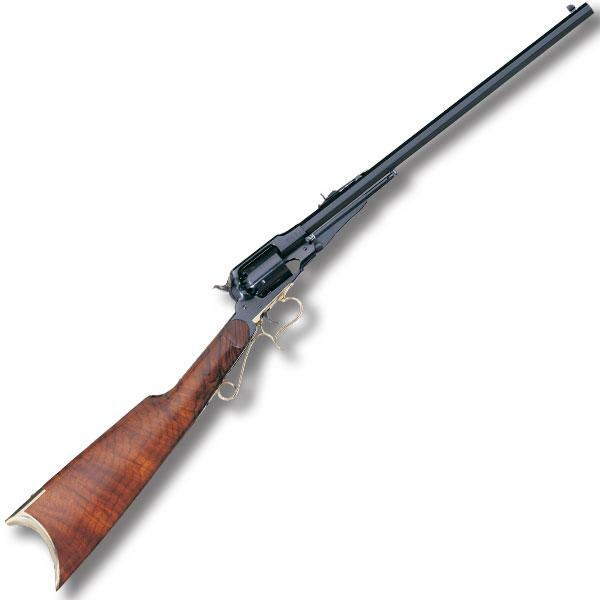 In the early 1800's manufacturers were chasing the dream of a repeating rifle. Something that seems utterly common today, the man that perfected such a thing was bound to be rich beyond his wildest dreams. One of those dreamers was Sam Colt who perfected the revolver. This repeating handgun made his reputation, and his fortune, and he soon adapted it's principles to a rifle. On paper it looked great, a rifle capable of numerous shots before reloading. An early version was used by the US Army, who had purchased a number of revolving handguns and rifles in 1838, for the Seminole wars. They were effective initially as the native Americans would rush the troopers after the first volley not expecting several more volleys immediately. They changed their tactics soon after. The percussion revolver reached it's peak with the Model 1855 revolving rifle, but a nagging problem remained. A revolver's cylinder holds the bullets and powder, and in itself is a miniature rifle barrel. In a six shot rifle with one cylinder chamber lined up with the barrel, that leaves 5 chambers aimed at the shooters left hand grasping the barrel to steady the rifle. These early percussion guns suffered from a condition known as "chain fire" in which hot gas leaking from the gap at the front of the cylinder, or from ill fitting primers, could touch off the charges in the rest of the chambers, severely wounding the shooter of a rifle. In a pistol the effect is pretty scary, but since all of the shooter is behind the cylinder, it's relatively harmless. The invention of the brass cased cartridge solved this problem, but the damage was done and the rifle was discontinued in 1864. Numerous companies make a version today, but some have been modified with a guard in front of the cylinder to please the lawyers like Taurus/Rossi's Circuit Judge. Others, like Uberti's, are faithful copies of the originals. They are much safer to shoot than in 1855, but a thoughtful shooter would keep both of his hands behind the cylinder.